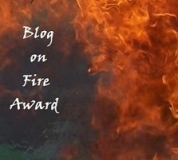 I have been nominated for the Blog on Fire Award by the blog Lovely Buns! If you haven’t heard of Lovely Buns or have yet to check it out, do so. It has charm, amazing recipes, and photos to match. The rules for accepting this award are: I must share with you 8 things about myself, and list 8 blogs which I love to visit. Love that you listed “cold cat ears” as one of the things you love! That’s so cool.